Directions to address Tualatin Skatepark: Oregon, Tualatin, 20 minutes south of Portland. Take I-5 South to the Lake Oswego, Durham Road Exit. Then take a right followed by a quick left at the light signal. The follow this road till it T's and go left. Follow this road till it T's again and then go right and you will see a park on your right. The skatepark is locate in this park. Comments: LITTLE, LITTLE, LITTLE.... structures for you to skate on: A 3-foot bowl and a Pyramid; rails, kinked rails and a mini-pyramid, as well as concrete steps and 3 mini-halfbowls, all with lots of coping. This park is pretty fun just to dink around but isn't very challenging. A prime example of Purkiss Rose's "safe" skate parks (an oxymoron in my opinion). Go here early to avoid crowds, which make it nearly impossible to skate as there are so many conflicting lines. Comments: Located in a great park setting with Tennis courts and other fun recreational stuff! Check out the tile mosaic with skateboarders in it, this skate park is here to stay. Directions to address West Linn Skatepark: Oregon, From I-205, take the 10th St. West Linn exit. If you are coming from Portland, take a right off the exit and the road T-s immediately. Take a right at the T and follow Salamo Rd. up the hill about 2 miles. You will come to a shopping center on your right, and take a right onto Parker Rd. Follow Parker Rd. down the hill 1/4 mile and the park is on the right. Description West Linn Skatepark Oregon: This park is gnarly. 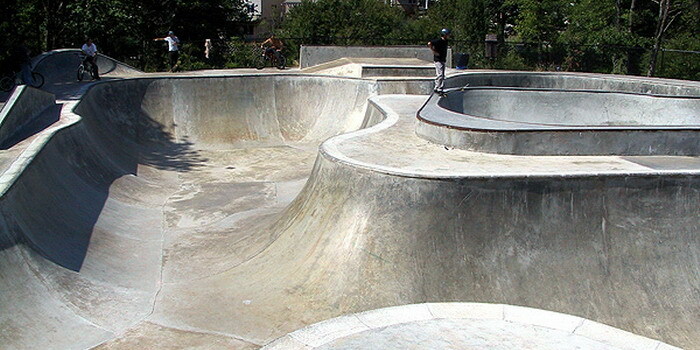 Fast, deep bowls with pool coping is the best part of the park. There is a smaller, shallower area with a pyramid and surrounding the entire park there are a few street obstacles such as a rail, a big four stair, and ledges. Park is free and open dawn to dusk.